Following three successful food drives, organic produce and natural grocery delivery service gives back to those in need in Columbus. COLUMBUS, Ohio (Jan. 14, 2013) – Green B.E.A.N. Delivery, a company that delivers organic produce and natural groceries to Columbus homes and workplaces, is donating 4,277 pounds of fresh produce to the Mid-Ohio Foodbank on Feb. 1. To date, Green B.E.A.N. Delivery has donated more than 19,000 pounds of food to the Mid-Ohio Foodbank. During a food drive with WCBE-FM (90.5) from Nov. 26-Dec. 31, 2012, Green B.E.A.N. Delivery announced it would donate 2 pounds of food for every monetary pledge made to WCBE-FM to help the less fortunate members of the local community. 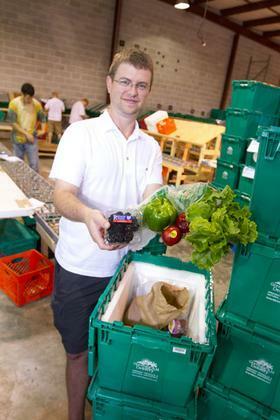 The result of the initiative is 2,190 pounds of produce donations from the company. In addition, Green B.E.A.N. Delivery ran the Constant Canned Food Drive from November 6th and asked its members to place non-perishable food items in their delivery bins before pick-up/drop-off. The company pledged to match every pound donated by its members. The result is an additional 2,087 pounds of produce being donated to Mid-Ohio Foodbank. Green B.E.A.N. Delivery is a company that provides home delivery of organic produce and natural groceries to Indiana, Ohio and Kentucky residents. One of the company’s primary missions is the fight against hunger. It's a New Year! Time for a new YOU. It’s a New Year, time for a new you. This month only (January 1-31, 2013), the first 125 listeners who donate to WCBE will receive a complimentary one-month pass to Metro Fitness Gyms and two one-day tickets to the Arnold Fitness EXPO, March 1-3. Give your money a workout; donate online today to the WCBE Fund and help keep public radio AND yourself fit in 2013. HAPPY NEW YEAR! At central Ohio's NPR station, fundraising is a team effort and the most important members of our team are... YOU!